Charles M. Duke Jr. explored the rugged highlands of the moon’s Descartes region with John Young during the Apollo 16 mission in April 1972. Duke was born October 3, 1935, in Charlotte, North Carolina. He received a Bachelor of Science degree in naval sciences from the U.S. Naval Academy in 1957 and a Master of Science in aeronautics from the Massachusetts Institute of Technology in 1964. Following his graduation and commission from the Naval Academy, Duke entered the U.S. Air Force and received flying training at Spence Air Base, Georgia, and Webb Air Force Base, Texas. He completed advanced training in F-86L aircraft at Moody Air Force Base, Georgia. He served three years with the 526th Fighter Interceptor Squadron at Ramstein Air Base, Germany, before transferring to the Aerospace Research Pilot School. Upon graduation from the school he remained on as an instructor, teaching control systems and flying in F-101, F-104 and T-33 aircraft. Duke was among 19 new astronauts selected by NASA in April 1966. After serving as a member of the astronaut support crew for Apollo 13, he was named Lunar Module pilot for Apollo 16, along with Commander John Young and Command Module pilot T.K. Mattingly. They were launched April 16, 1972, and reached the moon three days later. While Mattingly orbited the moon in the command ship “Casper,” Young and Duke landed their lunar ship “Orion” on the Cayley Plain in the Descartes highlands. During three outside excursions over three days, they drove a Lunar Rover 16 miles and collected 213 pounds of lunar rock and soil. In 1975, Duke retired from NASA to enter private business. He is a president of Charlie Duke Enterprises, Inc., and is an active speaker and Christian lay witness. He is a brigadier general in the U.S. Air Force Reserve. Duke serves on the Board of Directors of the Astronaut Scholarship Foundation. 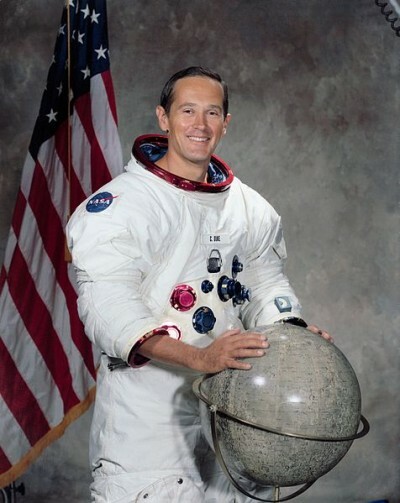 Charles Duke was inducted into the U.S. Astronaut Hall of Fame on October 4, 1997.